Bob Payne, a wonderful, funny, clever, hardworking person and writer (including contributing editor Condé Nast Traveler) joined our expedition to pick up debris at Bellingshausen station. 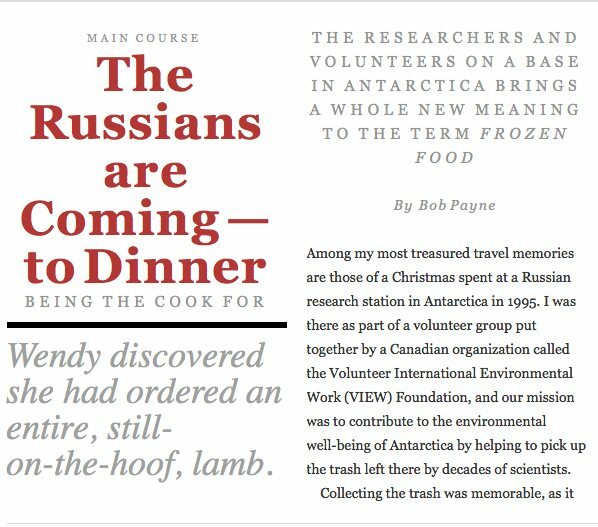 He wrote this story in Real Eats–a magazine app for those with iPads ($.99). 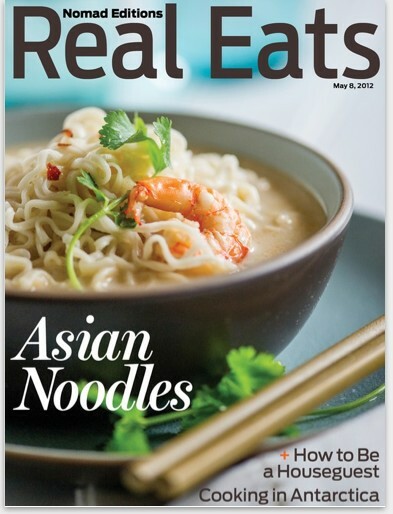 Real Eats editor is Barbara Fairchild, former editor of Bon Appétit. …Collecting the trash was memorable, as it included everything from rusty nails to an abandoned personnel carrier, all of which would be shipped to South America for recycling. But even more memorable was the time we spent together when not working, much of it around a table where we shared meals and stories. With our group were two Canadian women, Carol Devine, the project leader, and Wendy Trusler, who did the cooking not only during the few days I was there but for the entire three-month program. I have not seen them since, but in the way travelers often do who share intense experiences for however brief a time, I’ve continued to consider these women my friends. So I was delighted, all these years later, to learn that after having gone on to such endeavors as pursuing an interest in the visual arts (Wendy), working in Rwanda, Sudan, and East Timor for Doctors Without Borders (Carol), and having children (both), they are again collaborating on a project, The Antarctic Book of Cooking and Cleaning. I spoke to Carol and Wendy again recently, and according to them, their challenges began even before they left Toronto for Ushuaia, the Argentine city at the tip of South America from which the majority of ships to Antarctica depart. In Ushuaia, they bought three months’ worth of provisions from a supplier they communicated with largely through hand gestures. Which is why, when the provisions finally arrived, Wendy received not the few lamb chops she thought she had ordered, but an entire, still-on-the-hoof, lamb. “Great, now I’m a butcher, too,” she remembers thinking. They brought all of their own cooking gear, including a small gas stove that produced soot all season, but were provided with a battered shed that served as the volunteers’ kitchen and dining area. Most interesting about the shed, which the Russians dubbed Canada House, was that one of the walls, lined with a rack containing empty vodka bottles, rolled back to reveal a wire-filled hideaway that had apparently once been a KGB radio room. The room made an excellent pantry, and the empty vodka bottles served admirably as spice containers. The biggest challenge, at least in the beginning, was trying to figure out the relationship between the volunteers and the Russians. 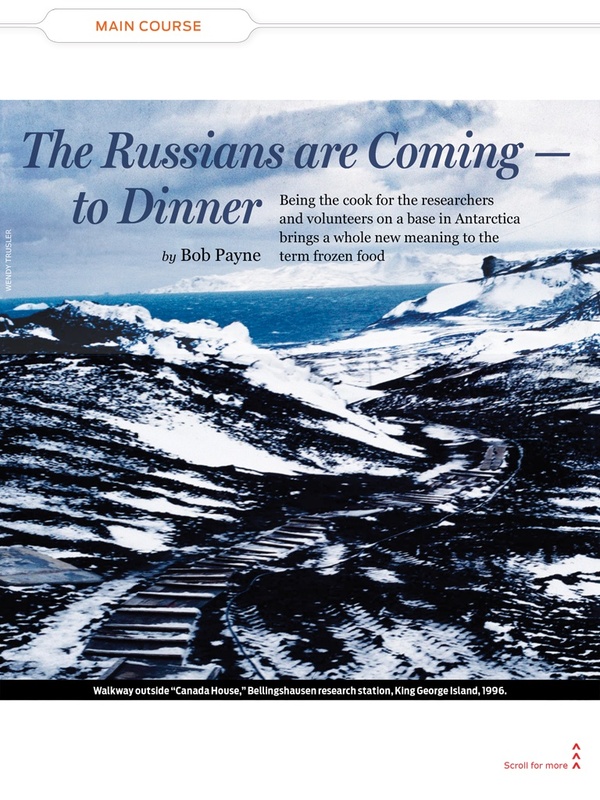 Food, it soon became apparent, was the common language of Antarctica, and not just between the Russians and the VIEW volunteers. The station was on King George Island, just off the finger-like projection of the Antarctic Peninsula, and because of its relative proximity to South America (admittedly, across the stormy Drake Channel, where the Southern Ocean seas routinely topped 20 feet or more) the island was also home to nearby bases belonging to Chile, Uruguay and China. “We visited the kitchens of each base, and every time we did we were instantly transported to that country,” Wendy says. Most of the recipes Wendy experimented with were of course Russian — roasted beet salad, cabbage rolls, borscht — and some of the experiments had unexpected results. “Are you sure this is borscht?” one of the Russians said of an early attempt at the classic Eastern European beet soup. 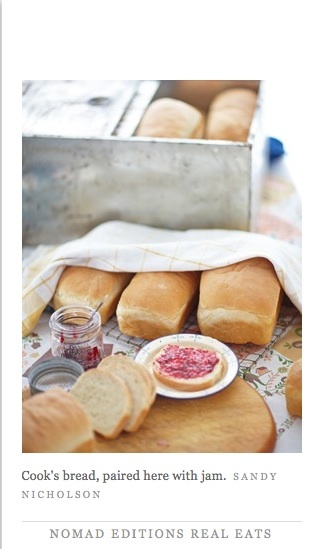 Ultimately, though, it was a success, as was her bread; that recipe, and the use of the oven, she got from the Russian chef, Valodia, although she never had the courage to exactly follow his proportions, which called for 100 cups of flour. The VIEW volunteers saw Antarctica at its most benign, during the December-to-February “summer” months, when temperatures were seldom more than a few degrees above or below the freezing point. Still, because going to a favorite shop for a missing item was not an option, innovation, and resourcefulness, played a necessary role in just about every effort.